Crew 61 after posting to 462 Squadron, Foulsham, Norfolk. 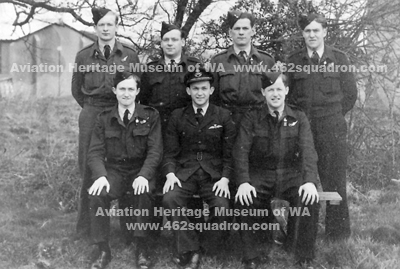 Back row, left to right: F/Sgt Jock Lee (R/AG); F/Sgt Bill Railton (W/Op); Sgt Tom Walker (F/Eng); F/Sgt Max Gribble (M/UG). 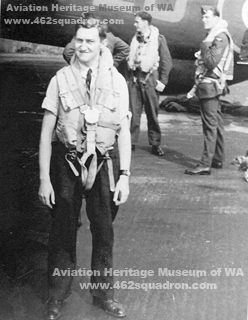 Front row, left to right: F/O Arthur Cowley (B/A); F/O Neil Sullivan (Pilot); F/O Keith Currie (Nav). 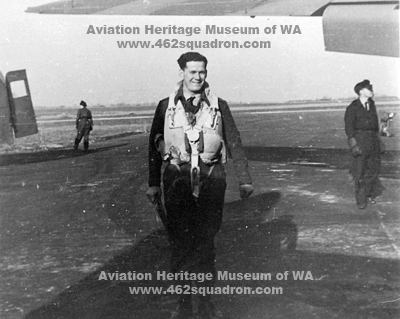 Reference sources – Australian WW2 Nominal Roll; The National Archives of Australia (Service Files, 462 Squadron Operational Record Book); Aviation Heritage Museum of Bull Creek, Western Australia; 462 Squadron veteran Tom Walker. Special thanks must go to former Flight Engineer Thomas WALKER for photos and information on his page. Tom and his wife Rose (now deceased), and their son Gary, greeted me at the Yorkshire Air Museum, Elvington, on a rainy Sunday 08 July 2012. They showed me around the Museum, we had lunch at the NAAFI Canteen, and we talked about 462 Squadron. Tom was also the first person to make contacted, on 9 September 2009, just 3 days after this Tribute website went live on 6 September 2009. 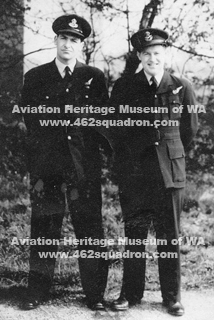 Thanks also to Personnel at the Aviation Heritage Museum, Bull Creek, WA, for the many photos of 462 Squadron. The photos shown on this page mostly feature Keith Currie, who enlisted in Perth, WA – he may have donated them to the Museum. Sullivan's Crew awaiting take-off in Halifax Z5-A 'Able' on 02 April 1945, destination Hamburg. Left to right: 1. MU/AG Max Gribble, 2. R/AG Jock Lee, 3. F/Eng Tom Walker, 4. 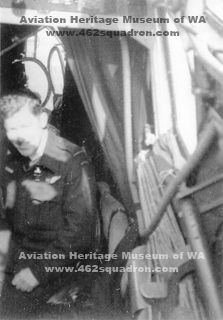 Pilot Neil Sullivan, 5. unidentified person part obscured. 4. unidentified, 5. Neil Sullivan facing camera, 6. Keith Currie facing camera and holding bag and parachute. See more photos of this crew around Halifax Z5-A on 02 April 1945, on the Tom Walker page; plus one photo with the 2 Gunners on a Triumph motorcycle repeated on the Halifax page. The 8th man for this SD Op, to dispense WINDOW, was F/Sgt E.D.Tisdell, 432388 RAAF. Sgt Tom Walker awaiting take-off in Halifax Z5-A 'Able', 02 April 1945. Left background – may be the crew truck, and possibly female driver? Navigator Keith Currie at Foulsham, 1945, date and location not recorded. If you can identify where on the RAF Station this was, please make contact. 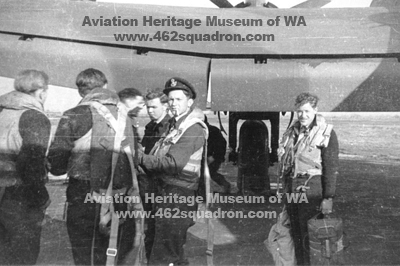 This photo appears to have been taken at the same time as a photo on the Walker page, which showed the Crew relaxing on the ground outside the Parachute Room, awaiting take-off. Navigator Keith Currie 436316 RAAF, 462 Squadron, Foulsham, 1945; in a Halifax beside the Navigator's work station. The Bomb Aimer's perspex can be seen in the background. 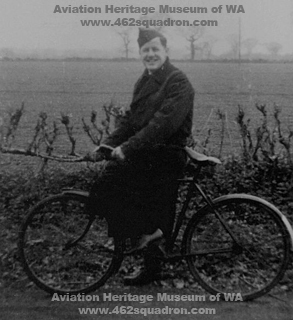 Navigator Keith Currie with bicycle, undated and location not recorded, but assumed to be at Foulsham, sometime in 1945. 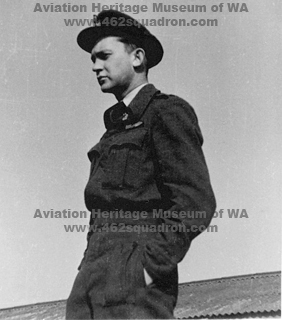 Museum catalogue caption: "Flight Lieutenant Keith Currie, England, circa 1945". He was recorded in the ORB as F/Lt on 09 April 1945, but as F/O on all Ops before and after that date. He was posted from 462 Squadron in September at the rank of Flying Officer. 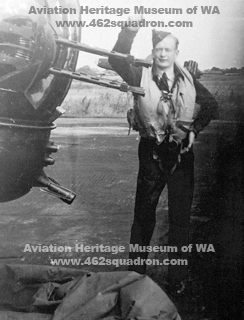 Left – Unidentified AG or WOp/AG – the Museum catalogue caption incorrectly named him as "Sgt Jack Lee", but it is not him (see photo below of Rear Gunner F/Sgt Jock Lee) If you can identify this person, please make contact. Bomb Aimer Flying Officer Arthur Cowley, awaiting take-off in Halifax Z5-A 'Able' on 02 April 1945. Background, Left to right: 1. obscured, 2. Tom Walker, 3. Unidentified. Rear Gunner F/Sgt John Cairns LEE (Jock) beside the rear turret of Halifax Z5-A, 02 April 1945, from the same sequence of photos shown above, and on the Walker page. In the background is another Halifax of 462 Squadron, with the distinctive vertical stripes o the tail fin. Original caption from Museum: "Acaster Malbis, October 1944, Crewmen on an Assault Training Course." From left to right: 1. unidentified, 2. unidentified, 3. Navigator Keith Currie, 4. unidentified, 5. Rear Gunner John Cairns LEE. Several have mud on their faces, so photo was possibly after a cross country exercise. For a description of what happened during training at Acaster Malbis, please read "Recollections of War" a memoir by Al Oakes. From his RAAF A9301 Service File – Jock Lee was posted TO 41 Base Acaster Malbis on 20 October 1944, and posted FROM there TO 74 Base, 1658 Heavy Conversion Unit, Riccall, on 07 November 1944. Age 21 years & 9 months in April 1945. Ops listed in a later section. One Op with each of the following, except for Toohey. Please refer also to the SD WINDOW page for additional information and photos of some of these men. 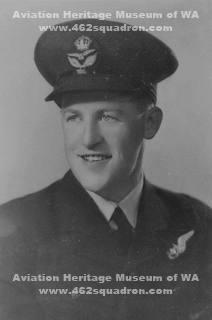 Of the 6 RAAF members of crew, only the Service File for Rear Gunner John Cairns LEE had been digitised. He had also been in the Australian Army before enlisting in the RAAF. While posted to 27 Operational Training Unit at Lichfield, he was injured and hospitalised for some time. This detached him from his initial crew, and he later crewed up with Pilot Sullivan. From Jock Lee's Service File, and information from Tom Walker, the following dates and movements for the Sullivan Crew are known. 20 October 1944 - Posted to 41 Base, Acaster Malbis; Jock Lee training with Keith Currie (see photo in previous section). 07 November 1944 - Jock Lee posted to 74 Base, 1658 Heavy Conversion Unit, Riccall, Yorkshire (assume with Sullivan crew of 6). 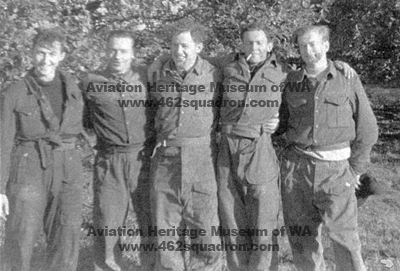 7 March 1945 – Lee and Walker and Crew posted to 462 Squadron, 100 Group, Foulsham, Norfolk. Crew 61 was assigned to "A Flight" with Deputy Flight Commander Fl/Lt Edward (Ted) McGindle. 24 March 1945 - first Op for Sullivan crew at 462 Squadron (see later section for all Ops details). 10 April 1945 – Crew 61 were on leave until 19 April 1945. F/Eng Tom Walker was married to Rose on 14 April 1945. During this Crew's leave, Alf Ball & Crew 59 Failed to Return on the night of 10/11 April, and Allan Lodder & Crew 44 on the night of 16/17 April. 02 May 1945 - last Op for Sullivan crew at 462 Squadron. 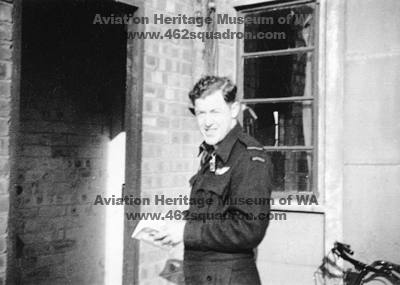 17 September 1945 - LEE posted to 9 Aircrew handling Unit (9 ACHU), Gamston; all other members of this crew were also posted from the Squadron in September 1945. More information from his Army Service File B884, RAAF Service File A9301, and RAAF Casualty File A705 from Lichfield will be added for 6 July 2018 site update. 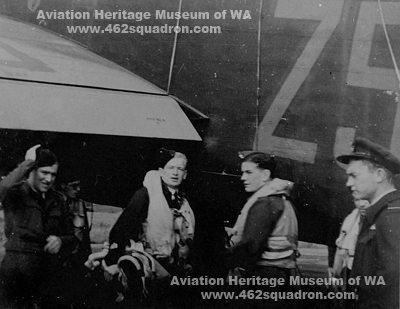 Crew Ops – carried out by this Crew while posted to 462 Squadron, "A Flight". The following table lists the 8 Ops for Sullivan and his crew, during March, April and May 1945. There were no substitutions or changes for the usual crew of 7. On all eight Ops they carried one extra crew member for Special Duties, to dispense WINDOW. Aircraft Serial as listed in the Operational Record Book, Forms 541, from the National Archives of Australia. Aircraft Code numbers Z5- were not listed in the ORB, but were available from F/Eng Tom Walker's log book entries, and compared with other sources; ORB information was also cross-referenced with Tom's log book Op dates & targets. Times up and down in red are night flights. Target "Ruhr x 5" means 5 aircraft tasked from 462 Squadron to the target of the Ruhr, with Sullivan's crew being one of those 5 (and so on for the other dates). Target "Schönebeck x 11 (of 12)" means 11 aircraft tasked from 462 Squadron to the target of Schönebeck, with Sullivan's crew being one of those 11; with a different target for the extra 462 Squadron aircraft (and so on for the other dates). There was some variation in the spelling of Target names in the original ORB. Code for Op Type – SD Special Duties; SP Spoof; W WINDOW; TI Target Indicators; I Incendiaries; F Flares; B Bombing. Comments include names of extra crew members to dispense WINDOW. This crew did not have any early returns, but once landed away after being diverted from Foulsham due to low cloud. F/Sgt E.D. Tisdell, 432388 RAAF (later KIA, Lodder Crew). F/Sgt M.P. Toohey, 429056 RAAF; landed away at Tangmere, diverted due to low cloud at Foulsham. Halifax PN433 Z5-A may be seen on the Halifax page and also on F/Eng Walker's page. MZ431 Z5-J is also shown on the Halifax page. Halifax Z5-A is clearly identified in the series of photos on this and the Tom Walker page. The aircraft serial number appears to be PN433/G. However the Squadron Operation Record Book (Form 541, page 313) for 2 April 1945 lists this Crew as flying Halifax LG-432. The serial with /G indicates an armed Guard was required, due to the Special RCM equipment on board (Ref: Lax & Kane-Maguire page 455). LG432 Z5-A – recorded on 02 April and 04 April 1945; 2 Ops only, overshot runway on 04 April by O'Sullivan's Crew 43. These two may have been the same aircraft, but with errors in serial record? PN427/G Z5-A – crashed 15 April 1945 (Ref: Lax & Kane-Maguire page 454; not listed by Batten; not listed in ORB). It would appear that PN433 was in use earlier than late April, i.e. on 02 April, based on the photos. More research is required to sort out this conflict in information. If you can assist, please make contact.